Illustrated by Brad Sneed. 32 p., Phyllis Fogelman Books, 2001. Two brothers, Ebenezer and Obadiah, live and farm contentedly together until one day, Obadiah comments that there are lumps in the oatmeal that Ebenezer made. Ebenezer overturns the bowl of oatmeal on his brother's head. After many days of silence, Obadiah cuts their house in half and hauls his half over to the next hill. Each brother farms alone, and each eventually marries and has children, and then grandchildren, and then great-grandchildren. They continue to think of each other, but they don't communicate directly. Eventually, two of their great-grandsons, Nathaniel and Luther, encounter each other at the wall that the brothers built to separate their farms. At first, they're hostile, but then, Nathaniel says, "Sorry." They find that they can become friends - after three generations of separation over a bowl of oatmeal. The illustrations have a silly quality that mirrors the silliness of the brothers' stubbornness. Kids will get a clear picture of the way stubbornness can affect relationships way out of proportion to whatever they were stubborn about to begin with. 34 p., Frances Foster/Farrar Straus & Giroux, 2008. Sometimes imagination can provide a way to calm yourself at a stressful time. As this wordless story begins, a girl looks angry at dinner and goes to bed. The images suggest that her mother is angry with her. In the girl's dreams, her teddy bear (who becomes as big as a bear) takes her to a forest where they dance with foxes, the bear catches fish, and they enjoy a campfire before going to sleep. The girl wakes up at home with her now normal-sized teddy bear beside her. She happily gets a hug from her mother. She has used her imagination, in the form of a dream, to resolve her anger and make her relationship with her mother available to her again. The linocut illustrations have an almost shadowy quality that adds to the impression of witnessing a dream. 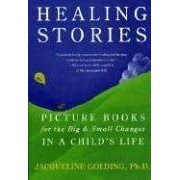 Children can take from this story a sense of the calming power of imagination. Illustrated by Terry Widener. 32 p., Farrar, Straus & Giroux, 2008. When a new baby comes into the family, it's hard to give up being a special only child. This is a little girl’s struggle in this story that's genuinely empathic with the experience of being a child. The girl lives in an apartment building full of friendly neighbors who share their diverse cultural traditions and a common value of helping others. This building, the House of Joyful Living, has a rooftop garden where they gather to talk, eat, and listen to music, and once a year, to have a party. The girl feels as if she's on top of the world on the rooftop, with not only her parents, but all the other "great, good" adults, to herself. The girl knows her mother is pregnant, but for most of the story, she pushes aside this knowledge. When a neighbor makes a special gift for Mama and the baby, the girl can't ignore this any longer, and she can't help worrying that the baby will consume all her parents' attention. She doesn't want to share; she doesn't want to lose the feeling of being special. When Mama and Papa comfort her, she can feel special again, and she begins to understand that the baby could be jealous of her. She finds herself feeling sorry for the baby, who is missing so much of her own wonderful experiences. And this inspires a sense of generosity toward the baby. Through her parents' loving responses, she's able to transform her hurt and envy into a secure sense of care and compassion. This story can help children find that care and compassion in themselves. Illustrated by Jane Manning. 32 p., HarperCollins, 2006. Sam the lamb has a cold, and feels a sneeze coming on - but he just can't quite sneeze. His barnyard friends try lots of ways to help, but the sneeze just won't happen. Finally, Franny Nannygoat and her kid kick up enough dust to get the sneeze going, and when they do, it's a huge one. With its infectious rhymes and rhythms, this story will help kids laugh at the hassles of having a cold.